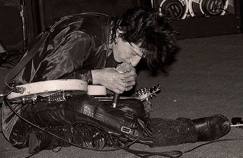 I'm new to the forum and am looking for a copy of Johnny Thunders - Ain't Superstitious / Midnight Hour (Scatterbrainchild Records). Hoping some one here might know where I can find one. Sorry, I don't have a spare copy of this and unfortunately this is blocked on Discogs, so check Ebay regularly. I sold my copy when the full show was released on cd and dvd.